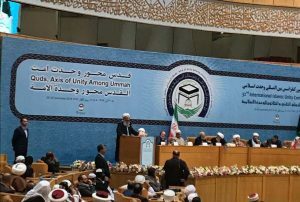 The most influential Iranian Sunni leader called on Muslim rulers around the world to recognize all ethnic and religious communities and equip them with their due rights. “Unfortunately challenges of the Muslim world have been neglected and there has not been any pathology to study main reasons behind the challenges and problems,” he added more. “We as Muslims have the assets of the Qur’an, the Prophet Mohammad PBUH, and Islam; many of Europeans and Americans and world nations do not have these assets. Despite it why Muslims suffer from problems and challenges?” he added more. “Implementation of justice is one of the important basics of Islam which is absent in Muslim countries. Unity is also one of the orders of Islam, but it has been facing challenges, too. These behaviors are the results of Muslims’ distance from the directions of the Qur’an and Sunnah,” he underlined. “There must not be any discrimination between Shia and Sunni Muslims; these discriminations should be removed,” Shaikh Abdol-Hamid urged. “Islam is the religion of act; if we act instead of talking and chanting slogans, all problems will be resolved. This conference has been held by the Forum for Proximity of Islamic Schools of Thought which has no administrative and executive authorities, but we convey message to governments to respect all citizens’ due rights. Then we can reach to unity and solidarity,” Khateeb of Sunnis concluded his points.